Hideway is a lakeshore cottage near Ballinrobe in County Mayo in Ireland. The cottage can sleep four people in two bedrooms which are made up of a double with en-suite and a twin with a separate bathroom. The rest of the cottage is made up of an open plan living area with kitchen, dining area and living area as well as an external utility. To the outside is off road parking for two cars and a gravelled area around the property. Set in a stunning location, HIdeway is a great place to enjoy at any time of the year. Ballinrobe is a lively market town on the River Robe in County Mayo. 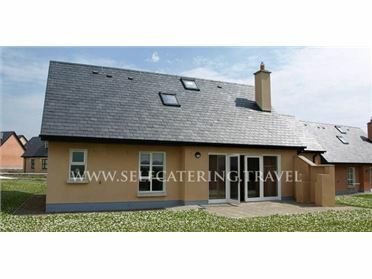 It is ideally located as a touring base for those wishing to explore Galway, Mayo and west Ireland. Ballinrobe is believed to be the oldest town in South Mayo, and is surrounded by many features of archaeological, architectural, historic and ecological interest. Ballinrobe is known as the lake angling centre of the west, and with 60,000 acres of lough fishing, and miles of river fishing close by. Oil fired central heating with open fire. Electric oven and hob, microwave, fridge/freezer, washing machine and tumble dryer in shared utility, dishwasher, TV with Saorview, Fuel, power and starter pack for fire inc. in rent. Bed linen and towels inc. in rent. Off road parking for 2 cars. Gravelled area around property. Two well-behaved dogs welcome. Sorry, no smoking. Shop, pub and restaurant 3 miles. Note: Hardcourt tennis court and children's playground on-site, shared with 2 other holiday cottages. Note: Fishing boats with outboard engines and qualified fishing guides available to rent from property owner..